I feel sorry for the little smoke detectors that came with my house. I'm sure they worked incredibly hard over the years, valiantly sitting watch around the house ready to detect smoke with total vigilance. All they asked was a yearly battery replacement and self-test. Then my family comes in and, like an Initech business consultant, I start asking "What would you say......you do here?". Next thing you know, the kitchen smoke detector has been retired to the tool closet and a Nest Protect is sitting watch in its place. The big question is, why would the average consumer want to purchase a Nest Protect at $110 over the traditional puck style smoke detector which costs around $25? Does the Nest Protect offer $85 worth of value over the puck? In my opinion, it does. To begin with, the Nest Protect has a sleek and stylish look boasting a square design with rounded edges, and a stainless-steel mesh cover that looks not only looks great, but gives smoke and CO2 a bunch of access points for better detection. 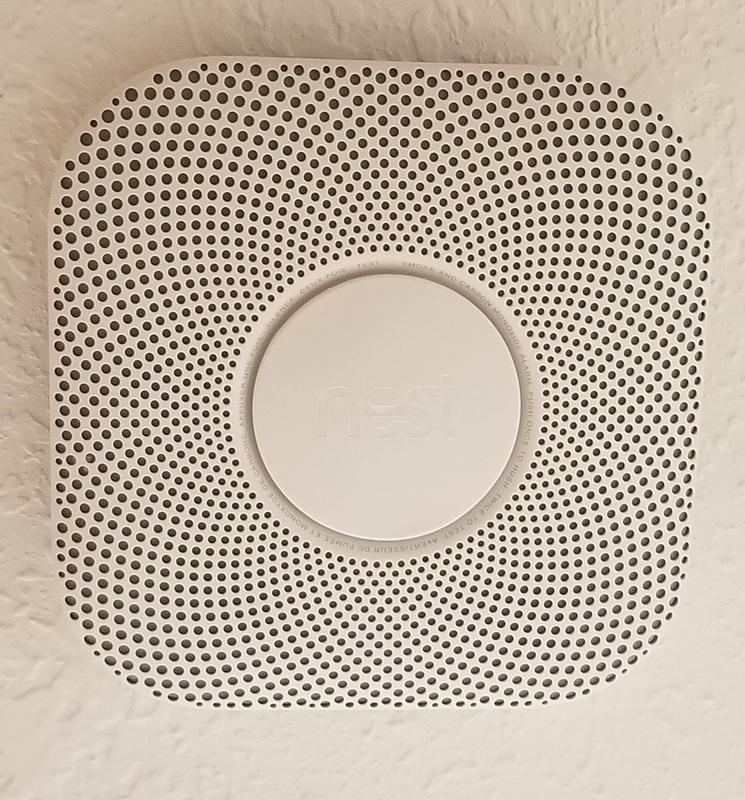 The Nest Protect is also an essential part of your smart home deployment, as it can alert you via the Nest app when smoke and/or CO2 has been detected. Just a few hours after installing a Nest Protect in the kitchen, the girls decided to cook some fried chicken on the stove. 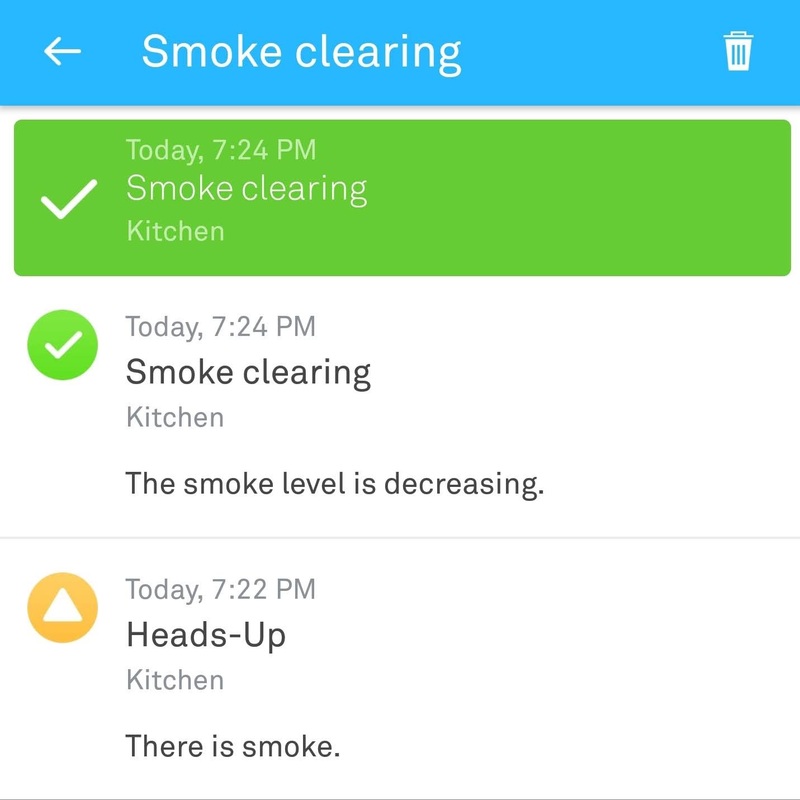 I was at rehearsals when the Nest app alerted me that smoke had been detected. 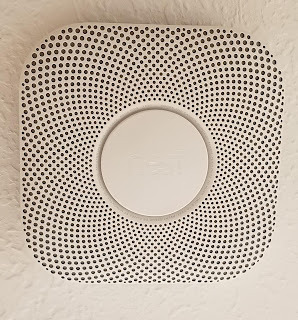 The girls later told me that the Nest Protect announced that smoke had been detected and if it continued, the alarm would sound and that it would be loud. 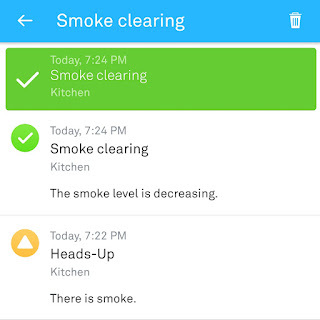 In cases like this, when there's just a little smoke due to un-vented cooking, the alert can be silenced via the app or by physically pressing the button on the device. If there's a large amount of smoke, however, silencing will be disabled. a soft white light in order to help you find your way. Ten seconds after you pass by, Pathlight turns off. If you have a Nest thermostat, then the Nest Protect can work in partnership with it. So, if the Nest Protect detects Carbon Monoxide, you have the option of allowing the Nest Protect to turn your furnace off via the Nest thermostat. This makes sense, as the furnace tends to be the primary cause of Carbon Monoxide emissions. The one drawback I see with the Nest Protect is that it doesn't integrate with Google Home. I know that some folks out there want to have the ability to have the connected light bulbs turn red during an alert or perhaps have some bulbs turn on to 10% brightness when Pathlight detects movement. Those are minor concerns for me. While I hope that Nest offers Google Home integration in the near future, it isn't a deal breaker for me. I'll be deploying Nest Protect devices in other areas around the house over the next few months. It was 10 years ago today that I pointed the domain name, virtualsink.com to the blog that I had been working on for a month prior. As explained in my introductory post, The Virtual Sink was borne out of the ashes of the radio shows that I did in Chicago throughout the 90's. It escaped to the Internet where it died a quiet death after the birth of my daughter. It rose from the ashes when the demands of being a father took up less of my time. Some said I would get bored of it within a year. Some said I'd never be able to keep generating content. Most didn't care either way. Regardless of your opinion, I'm still here spewing content. So, what's next? I had initially envisioned The Virtual Sink to be a collaboration between myself and the former co-hosts of both The Kitchen Sink and The Virtual Sink. That never happened because, surprisingly, their apathy level far surpassed my own. And, yet, I can't keep doing this for another 10 years, can I? I don't know. Maybe I invite some guest bloggers once or twice a month. Maybe I do some wider Youtube collaboration with some of my acting buddies. Maybe nothing changes at all and I keep plugging along until either I have nothing left to say or some foreign telemarketing scammer decides that they've had enough of my petty shenanigans and tracks me down to exact their revenge. Whatever happens, I'm here now and the last 10 years stand as a testament to my commitment to my own bloviations. For those of you who love the idea of having a set of Nanoleaf light panels in your bedroom, but don't want to shell out several hundred dollars, there's a cheaper alternative available. Check out the LifeSmart LED Smart Light Panels. At around $40 for three panels and a stand, they make the perfect nightstand lamp. You can buy larger kits, up to 10 on YescomUSA.com, or you can buy individual panels should you want to expand your current setup. I've had my eye on the LifeSmart LED Smart Light Panel kit for a few months now. Every so often, they will show up on some deal site like Slickdeals.net where they will get snapped up before I can manage to buy some. I've tried to buy direct from YescomUSA only to find that they are constantly sold out. So, they must be pretty popular, right? Either that or they need to ramp up production in the sweat shop. I was finally able to get my hand on a kit last week and I was pretty excited to put them together and see how they looked on my nightstand. The first thing I noticed when I got the kit out of the box was how small the panels are. These things are seriously tiny. Have a look at the picture below and you can see how they compare in size to my Google Home Mini and "Chomp" my small alligator head (I usually set the Google Home Mini inside Chomp's mouth so it appears as if Chomp is speaking). The next thing I noticed was how cheap the whole setup felt. The panels and the base both feel like they are made from the same type of molded plastic that you'd find in a kid's action figure playset. And mounting the panels onto the base does not feel very secure. It feels like the panels are staying in place thanks to gravity and fervent prayer. I was worried that a stiff breeze from the air vent nearby might blow the whole setup over. Despite my reservations about the cheap feel of the kit, I do have to say that the LifeSmart LED Smart Light Panels have performed very well. They can shine in 16 million colors and have a number of pre-programmed and customizable effects. The kit can also be controlled via Google Assistant or Amazon Alexa. There are some limitations, though. You can't command individual panels, so if you ask Google Assistant to turn the Colorlight red, then the entire kit is going to be red. And I don't think that there's a way to have your smart hub enable a certain effect. You'll have to use the LifeSmart app directly for that. Overall, even though I've been referring to them as "Redneck Nanoleaf", the LifeSmart LED Smart Light Panels are not a serious substitute for the Nanoleaf. They'll never be the big showpiece of your smart home setup. The panels are, however, perfect for a desk lamp or a nightstand lamp and they are priced for that sort of function. Kim, a rep from Patient Care Service called me. She asked if I had pain in my back, hips, knees or ankles. I was struck by how bland her reading of the script was and asked her when she had lost all passion for her job. She responded by saying that she was only reacting to my vibe. At that point, I suggested we rewind the conversation and start again. Which we did. And I responded with much more enthusiasm. This cracked her up. We've had our little French Bulldog for 4 months now and I thought I would provide an update on her. We've named her Luna. I had forgotten how much I enjoyed having a dog around the house. I hadn't had one for about four years since my shih-tzu/poodle mix passed on back in 2015. Squats down outside and pretends to pee in the hopes of getting her training treat right away. Charges after dogs three times her size hoping to play with them but leaves dogs her own size alone. Desperately wants to play with the cat. Kitty is not amused. Has developed the ability to climb over the baby gate so that she can get into the kitchen when dinner is being made. Scratches at the dishwasher door because she wants it down so that she can sit/lay on it. "I'm ready to help wash the dishes!" Loves belly rubs.....but only from me. I was at the local pub the other day and bumped into the vet-tech when I walked up to order a round of drinks. "Why do you look so familiar? ", she asked me. "I'm an actor?" I offered. "You're the vet tech at my vet's office". "Right! What's your name again?" "My dog's name is Luna"
"OH YEAH! The FRENCHIE! OH MUH GAWD HOW IS SHE????". Only four months old and already her reputation is overshadowing mine. After an impromptu Pocket Cookies reunion show in the South Suburbs this weekend (we were terrible, but the audience was kind), I decided to head on over to the local White Castle for some delicious burgers. While awaiting my usual gallbladder-busting order, I noticed something called "The Impossible Slider" for $1.99. A quick Google search revealed the concept behind this burger. I added one to my order. Impossible meat is the brain child of Impossible Foods, a company that develops plant-based substitutes for meat and dairy products. The so-called Impossible Burger is said by many to be a very close approximation of the taste, texture and flavor of an "actual" burger. How do they achieve this "impossible" feat? Scientists at Impossible Foods discovered a plant-based heme molecule. The heme molecule, when present in meat, is a key factor in how meat behaves. Heme gives blood its red color and helps carry oxygen in living organisms. It is abundant in animal muscle tissue and is also found naturally in all living organisms. Plants, particularly nitrogen-fixing plants and legumes, also contain heme. Using heme along with proteins and fats derived from plants, Impossible Foods created a burger that sears and "bleeds" when cooked. But, how does it taste? You know what, if I had to eat this stuff for the rest of my life, I wouldn't be tempted towards suicide right away. Unlike the regular 99 cent veggie slider, which tastes like packed ashes, the Impossible Slider does actually taste like an traditional burger. I had hoped that it would be more like an approximation of a regular slider, but that's apparently not what they were going for here. The Impossible Slider is a thicker patty so it tastes a lot like a burger shot slider. Not what I was expecting, but still a pretty decent burger. If you're interested in trying an Impossible Slider yourself, they are available at all 377 White Castle locations. Further, different types of Impossible Burgers are available at over 3,000 different locations in the United States and Hong Kong. A rep calling himself "Henry" called me trying to get me to sign up for some kind of energy savings scam. I pretended to constantly forget his name, often asking him to remind me what it was and then calling him something completely different. I started to stall when "Henry" asked for my Com Ed account number. At that point, the rep put me on mute and chimed back in a few time to make a noise that sounded like a bad imitation of a modem connecting. He went full 2400 baud on me! He ended the call by pushing a bunch of buttons on the phone. I recently got a new bedroom set for the master suite in my home. This included a new king sized bed, which, of course, meant that I would need a new mattress and box spring. The prospect of hauling a both a box spring and mattress from one of the local furniture stores didn't appeal to me, and neither did the thought of having to fit a stiff box spring around the delicate corners of my house that lead into the master bedroom. A mattress is much more supple than a box spring and can take the corners easier. The slats of a box spring might crack if worked too hard into a doorway. Thankfully, a solution came in the form of the Zinus Armita Smart Boxspring. How is this for a concept: Assemble your box spring inside your bedroom so that you don't have to haul that behemoth in a pick-up truck or work it around the corners of your house. This is the convenience that Zinus Armita Smart Boxspring offers. 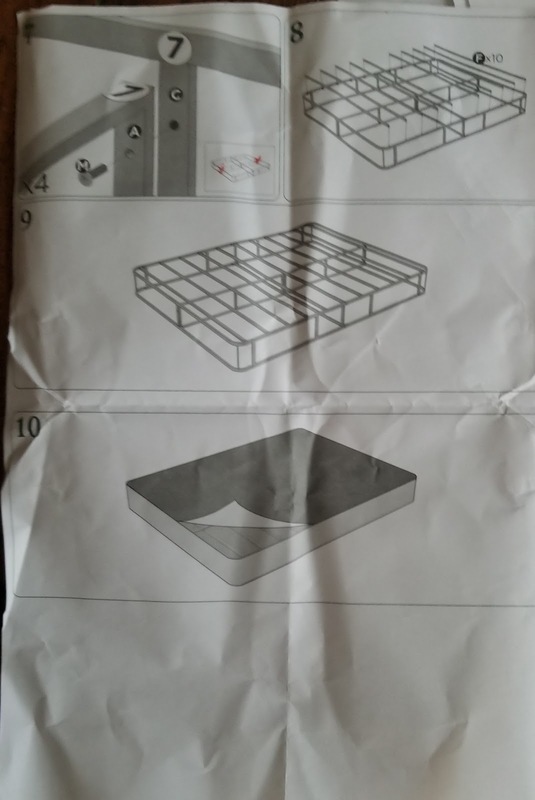 I know that there are those of you out there that are at least a little bit daunted by the thought of having to put together your own box spring. But, never fear! 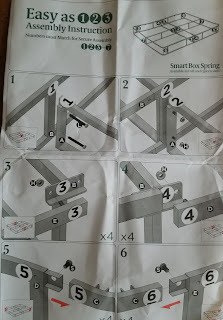 Putting together the Zinus Armita Smart Boxspring was so easy that I had it done within 15 minutes. The hardest part was zipping the cover over the box spring once I had all the parts assembled. 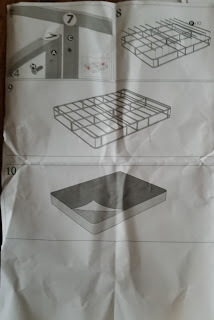 I don't recommend doing that part alone with a king sized box spring as it can be a bit unwieldy. The Zinus Armita Smart Boxspring is made of steel rather than wood, which makes the box spring a bit less heavier than a traditional one. If that gives you pause, I do believe that there is a wood version available, but I honestly don't think that there's any difference in stability. Whichever version you purchase, there's a small but significant savings in the purchase price over traditional box springs. Where you really save is convenience. Overall, I liked the Zinus Armita Smart Boxspring enough that I purchased a full sized one for my daughter's new bed and she's very happy with it.